Older XLink hardware does not work with Windows 8 or Windows 64 bit systems as originally shipped and sold. Please see this link for more information. 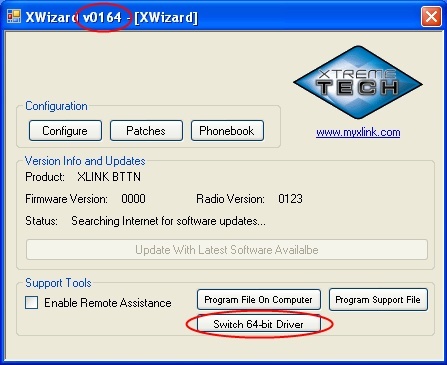 We have added the ability to the XWizard to update the USB of these older units so that they will work with Windows 8 and 64 bit systems. The update has to be done on a 32 bit computer that the XLink connects to. Once updated, the XLink will connect to 32 and 64 bit computers. To do the update simply follow these steps. Note that the Update button is only available if the XLink is not already been updated.